Dr. Michael Lange, Optometrist, discusses buying prescription glasses online. In today's economy everyone is looking to save money. Online eye glasses are becoming more prevalent on the Internet these days. Is it a good idea to buy eye glasses online? Dr. Michael Lange, optometrist with Lange Eye Care in Ocala, Florida, says no! 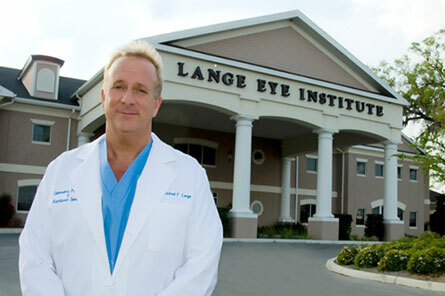 Dr. Lange founded Lange Eye Care and Associates 20 years ago and has ten locations in Florida. Dr. Lange states, "You get what you pay for. If it sounds too good to be true it usually is." He says it's a big mistake for people to shop for their prescription glasses online. People should purchase discount glasses or cheap eye wear from a local optical and get them made correctly the first time. Online eye glasses - why not buy cheap prescription glasses online? The process of making cheap prescription glasses is the same as making expensive prescription glasses and if fabricated by a local optical will be done correctly the first time. The customer needs to be present so the optician can take some specific measurements with the frame on the customer's face for it to be accurate. The frame must also be pre-adjusted on the customers face so that the measurements are accurate. There are at least five different measurements and adjustments that need to be made by the optician while the customer is present. If you buy glasses online then a statistical average will be used, or the customer will have to supply some of the measurements at the online eye glasses site. Some of the more sophisticated sites will have a computer program that will simulate the glasses on the customer's face and take the measurements via the Internet. This technology is still very new and has a lot of kinks to be worked out. Buying cheap eye glasses online - beware! If you are thinking about buying cheap eye glasses online you should think again. It is very difficult for the online eye glasses to be made to the exact specifications necessary for the customer to be happy. Customer service is therefore very poor with online eye glass companies. If purchasing eye glasses online the customer must make sure that the online eye glass company has a good warranty and return policy. Who is responsible if the customer cannot wear the glasses? What if the doctor made a little mistake on the prescription? Will the online eye glass company remake the lenses at no charge? If you are having a progressive lens made is it a name brand progressive lens or is it an imitation knock-off from China? What if the anti reflection coating you got from the online eye glass company starts to flake off after two months? Who is responsible? What if the frame breaks two weeks after purchasing them from an online eye glass company? If you purchase your prescription eye wear from the optometrist you had the eye exam with, then that optometrist will make every effort to make sure your glasses are made correctly and that you are satisfied the first time. However if there are any problems in the glasses you purchased from your local optometrist or optician they will make sure the problem is corrected at no charge to you. Dr. Michael Lange, Optometrist with Lange Eye Care states that he has had hundreds of patients that have had terrible problems by trying to save a few dollars and buying prescription glasses online. That it really isn't worth the hassle is what most people finally realize and they chalk it up to a lesson learned. If you think you may want to buy cheap eye glasses online think again. Go to a local optometrist and optician and see if they are willing to work with you on special pricing or give you some sort of discount or added value. Dr. Lange says, "Support your locally owned and operated eye care centers and you won't regret it." If you are looking for a great group of eye doctors in Florida go to www.LangeEyeCare.com. For more, read this article about Dr. Michael Lange, Ocala optometrist, or visit his blog.